Based on reviews from 22,632 users. Learn how our rankings work or see our guide to Polo Ralph Lauren sneakers. Updated Apr 2019. The Ralph Lauren Corporation was founded in 1967 by American fashion designer Ralph Lauren who is also the executive chairman and CCO of the brand. The publicly traded company holds various brands under it such as Chaps, Pink Pony, Club Monaco, and Ralph Lauren Collection and numerous sub-labels (Lauren, Ralph Lauren, Polo Ralph Lauren, among others). Their products are distributed under four main categories which are: fragrances, clothing, accessories, and home items. The company first became known for their neckties, tailored shirts, and preppy clothing for men and women but in succeeding years, they ventured into the streetwear market as well with their popular sweaters, knitwear products, and accessories such as sneakers. The company currently employs well over 10,000 people and owns over 500 store locations worldwide. They operate on three continents, namely Europe, Asia, and North America. If you love sneakers, then you’re probably already aware of their basic parts which are comprised of the uppers, the midsoles, and the outsoles. But if you don’t know what each part of the shoe does, here’s a brief rundown, as well as, a few more components that make up Polo Ralph Lauren lifestyle sneakers. The uppers are the top part of your Polo Ralph Lauren casual shoes which encase your foot. They can be made of different materials such as suede, mesh, canvas, leather, and more. Leather materials generally last much longer than other fabrics. They can be broken in and stretched to adapt to the wearer’s foot. Mesh is highly breathable and is ideal for the summer season, while canvas is usually very easy to clean. Quarters: These are parts of uppers that cover the back of the foot as well as the sides. Vamps: These cover the center and top part of the uppers. The midsoles make up the part between the uppers and the outsoles. The midsoles generally contain a lot of the tech stuff that makes a shoe faster, lighter, more cushioned, etc. They also provide stability, support, and shock absorption for smooth rides. Many midsoles are made of EVA (Ethyl Vinyl Acetate) or PU (Polyurethane). Some contain cushioning technologies like air or gel. The outsoles are the bottom part of each sneaker that touches the ground. These are usually made of blown or carbon rubber, or a combination of both. Blown rubber is softer while carbons are usually stiffer yet more durable. The insoles, also called sockliners, are foam inserts that make contact with your feet inside your shoes. Insoles protect your feet from rubbing against the sneakers’ seams. Some insoles are glued to the shoe while others are removable. They can also be thin or thick depending on their purpose. Some are quite flat while others provide arch support. A number of users prefer to remove their insoles and insert a customized one to get more cushion or support. The tongues can be seen on the upper part of your Polo Ralph Lauren sneakers, right under the eyelets and laces. Tongues protect the feet from rubbing against the lacing system of shoes. They also serve to keep debris and water from entering your shoes. Some are fully attached to the sides of sneakers while others are only sewn in from the bottom. The collars are the parts of your Polo Ralph Lauren sneakers which surround the ankle. Often, they are padded for comfort and protection. Lacing systems provide a way for users to customize the fit of their Polo Ralph Lauren sneakers to the feet, giving them the ability to tighten or loosen the fit according to the snugness they desire. Generally, the higher the cut of the shoe, the higher the lacing system goes, and the more secure the shoe is to the foot. Some lacing systems utilize flat laces while others use round ones. The Polo Ralph Lauren brand currently produces a variety of footwear ranging from low-tops to high-tops. To give you a better idea of what cut means, we’ve included samples of Polo Ralph Lauren sneakers under each category as well as some examples of how to style each shoe. Low-tops or low-cut shoes are footwear with collars that sit below the ankle. These generally promote lots of movements for the wearer and are suited for activities which need quick turns and movements. They are also much lighter on the feet than their high-top counterparts. Polo Ralph Lauren Halford - These low-top Polo Ralph Lauren sneakers are dressed in canvas and feature a minimalist design. The only concession to luxury is the proudly displayed embroidered logo branding on the outer side of each shoe. Shock-absorbent outsoles, breathable textile interiors, and cushioned insoles combine to make this silhouette a comfortable shoe to wear on casual to dressy occasions. The model is available in a wide range of rich colorways including black, red, and navy. The silhouette has a refined look despite its simplified form yet comes in an affordably-priced package. How to Style: These beautiful canvas Polo Ralph Lauren sneakers look great when styled with tapered rolled-up chinos and a relaxed-fit tee for casual Sundays. Change the tee to a short-sleeved polo shirt to dress it up a notch for a smart occasion. Polo Ralph Lauren Vaughn - If the preppy look is your thing, then these Polo Ralph Lauren sneakers are for you. The classic Oxford-inspired Lauren Vaughn gives off a casual vibe with its canvas fabric uppers, but touches of leather on the heels, tongues, and laces add a hint of elegance to the overall look. (Depending on the colorway, some feature leather on the shoes’ quarters as well.) The light material that makes up the uppers lend a lightweight feel to the low-top footwear despite its very sturdy sole. The Vaughn comes in an extremely wide array of color schemes to suit most preferences. 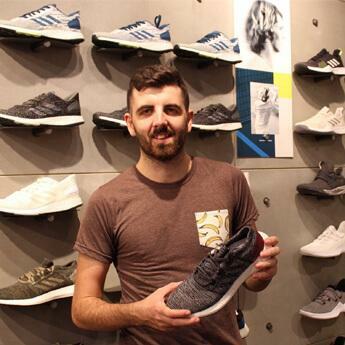 The shoe is available in men’s sizes which range from 7 to 17. How to Style: These stylish Polo Ralph Lauren sneakers will be easy to match with any of your spring to fall outfits. A classic pairing of an indigo-colored slim-fit long-sleeved oxford shirt with khaki pants will look great for a night out with friends. The Vaughn is sure to add a touch of polish to your look. However, for lazy weekend afternoons, a long-sleeved shirt matched with shorts and your Polo Ralph Lauren sneakers would be just the thing. Polo Ralph Lauren Jeston - These magnificent Polo Ralph Lauren sneakers fuse luxury and functionality seamlessly together. The Jeston boasts of supple burnished calfskin leather uppers and subtle perforation details. Leather insoles add to the opulent feel of the footwear. Perforation on the toebox and the sides of the shoes provide a modern touch while treaded rubber outsoles give excellent grip on surfaces, so you can strut these kicks wherever you choose. How to Style: Go sporty chic with the Jeston. These Polo Ralph Lauren sneakers will add a hint of luxe to any casual outfit you don. The low-top footwear looks good when matched with dark slim-fit stretch jeans and a hoodie (preferably heather-colored). You can also style the sneaker with shorts and a sweater. Polo Ralph Lauren Halmore II - The laidback Lauren Halmore II design offers a touch of luxe construction as evidenced by the white embroidered Pony on the side of each shoe. Suede trims on the breathable canvas uppers give the footwear an added “pop.” Padded collars and cushioned canvas insoles enhance the comfortability of these shoes while vulcanized rubber soles keep the footwear lightweight. The Halmore II is an update on the original which features a plainer canvas fabric as opposed to the interchanging zigzag design of the Halmore II’s textile material. How to Style: Let people know you ride with class by wearing the Halmore II. These dapper Polo Ralph Lauren sneakers will take your style up a notch even when paired with just shorts and a knitted sweater. You can also match the shoes with a long-sleeved white shirt and dark pants for a more dressed up but easygoing look. High-tops or high-cuts are footwear that cover the ankle and provide better support. They also provide better protection for the user in sports such as skateboarding where falling boards tend to hit the ankles. One disadvantage of high-tops, however, is they are generally much heavier than low-tops or mids. 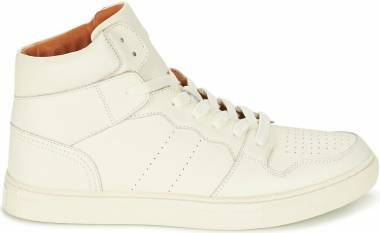 Polo Ralph Lauren Clarke - Classic styling with a luxe twist best describes these basketball-inspired high-top Polo Ralph Lauren sneakers. Depending on the colorway, the Clarke has canvas uppers with faux leather details or full leather uppers with suede accents. Stitched leather accent logos are featured on the outside sides of each shoe, and the footwear utilizes a lace-up fastening on the front. Rear pull tabs provide an easy on and off access. How to Style: Urban and preppy styling combine to make these Polo Ralph Lauren sneakers stand out. The chunky soles of the shoes and high-cut profile make these kicks ideal for any casual occasion, from coffee dates with a colleague to outings with friends. Flaunt the natty silhouette by pairing the shoes with tapered pants or rolled-up jeans. The models with canvas uppers are ideal for wearing during the summer due to its breathable uppers, but the leather ones can be worn throughout the winter season. Polo Ralph Lauren Pietro - Boot-inspired styling defines these high-top Polo Ralph Lauren sneakers. The ruggedly handsome Pietro has a look as seen in the nicely balanced combination of burnished leather and canvas that make up its uppers. Padded walls around the ankle provide a secure fit, cushioned tongues, and footbeds enhance comfort, and leather laces finish off the look of these timeless shoes. These high-top Polo Ralph Lauren sneakers also feature a rounded toe design, linen linings, and a typical lacing system. Colorways for this model are quite limited. How to Style:Own the preppy look by pairing these beautiful canvas Polo Ralph Lauren sneakers with vibrantly-colored slim rolled-up pants and a dark blue sweater over a light blue collared shirt. You can also style the shoes simply by wearing light-colored jeans and a button up collared-shirt. 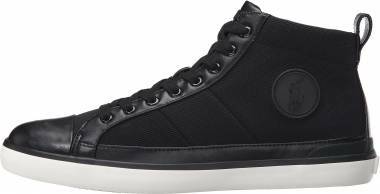 Polo Ralph Lauren Jory Calfskin High-Top- The Jory are Polo Ralph Lauren sneakers that are inspired by a classic court shoe. The brand put a luxe spin on what is otherwise a sporty footwear by dressing the shoes up in soft and burnished calfskin leather. The old-school look coupled with a minimalist design make for a truly eye-catching silhouette. The beautiful uppers sit on treaded rubber outsoles, and perf accents can be seen on the toes. How to Style: For a dapper casual look, rock these Polo Ralph Lauren casual shoes with slim-fit black jeans, a grey zip sweater, and black pea coat. You can also pair these shoes with slim blue jeans, a white shirt, and a denim jacket. 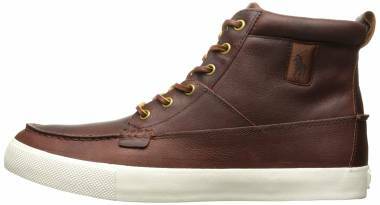 Polo Ralph Lauren Tedd - These rich-textured high-top Polo Ralph Lauren sneakers give off a smooth street look that is going to turn heads everywhere you go. The Tedd model is available in buttery suede as well as earthy leather and suede variations. The shoes feature a tubular construction, padded collars, and double stitching at the toes. A debossed pony logo on the outer side of each shoe and rough rawhide laces finish off the Tedd. How to Style:If you’re looking for shoes that give that perfect balance between dressing up and dressing down, then these Polo Ralph Lauren sneakers are for you. A laidback yet stylish look can easily be achieved by pairing these Polo Ralph Lauren sneakers with tan or mustard chino pants. Top off with a zip cardigan and a bomber jacket. You can also level your outfit up a notch by replacing the bomber jacket with a quilted gilet vest, and adding a long-sleeved white shirt and tie under the zip sweater. Mid-cuts are shoes with collars that sit halfway between high-tops and low-tops. They typically do not extend further than the user’s ankle. Mids allow for some ankle movement while at the same time provide some protection from ankle rolling. They also offer more stability than lows. 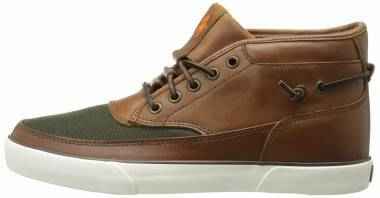 Polo Ralph Lauren Flossmoor- When chukka boot styling meets sneaker tooling, the successful result is something akin to the Flossmoor. These Polo Ralph Lauren sneakers provide an interesting combination of casual and dressy with their nicely patterned canvas uppers and neutral tones of tan or blue. The whole shoe sits on a vulcanized rubber sole and is available at an affordable price. How to Style: For weekends when you need to look smart but still maintain a casual vibe, these Polo Ralph Lauren sneakers will do the trick. Style them with jeans and a Classic Fit Polo Ralph Lauren oxford shirt. The Flossmoor also looks just as great when paired with chinos. Polo Ralph Lauren Calder Mid- These mid-top Polo Ralph Lauren sneakers are the best example of the cliche saying, “Simplicity at its finest.” The shoes are designed simply yet their clean lines are exactly the thing that makes them stand out with the focus directed at the material instead. Beautiful grainy leather uppers in navy or grey sit on grippy soles and are set off by rawhide laces. How to Style:Take a classic approach to styling by marrying these mid-top Polo Ralph Lauren sneakers with beige pants, a dress shirt, grey zip sweater, and a field jacket. You can keep it even more casual by matching the shoes with a white shirt and zip cardigan instead. Polo Ralph Lauren Hanford Mid - The streetwear chic Hanford Mid contains a mostly suede upper with mesh accents on the tongue and along the sides up to the collar. Leather panel trims feature the embroidered brand logo in a contrasting shade, and everything sits on top of a durable white vulcanized rubber sole. How to Style: Keep it preppy by pairing these Polo Ralph Lauren sneakers with slim pants in beige tones and a button-down long-sleeved cotton shirt over a tee. For errand runs and any casual occasion, you can’t go wrong with rolled-up jeans and your basic tee and jacket. Polo Ralph Lauren Trevose - If bold and modern is your style, then these Polo Ralph Lauren sneakers might just be what you need. The mid-top shoes are decidedly contemporary with their mix of textures ranging from mesh to smooth leather. Textured nylon side panels provide a nice contrast to the smooth leather toes. Available in five colorways, the Trevose proudly displays the pony signature in a contrasting shade (except for the blue model which features a tonal logo) on the outer side of each shoe. The outsoles are either in red or blue. How to Style:Casual is the name of the game with these Polo Ralph Lauren sneakers. The Trevose looks good when worn with ripped jeans and a hoodie. Elevate the look some more by matching with a fitted long-sleeved button-up cotton or denim shirt. Slip-on sneakers are typically low-cut shoes without a lacing system. Many of them have elasticated inserts that allow for easy on and off yet provide snugness on the feet when worn. They are quite lightweight, with a loafer-esque style, and very versatile. They are best worn on casual occasions such as beach outings, trips to the pubs, and errand runs, although a few can be dressed up for smarter occasions. Polo Ralph Lauren Thompson Mesh Slip-On - Fans of comfy footwear will find something to love in these Polo Ralph Lauren sneakers. The Thompson Mesh Slip-Ons are the brand’s follow up to the much-loved Vaughn silhouette. Interestingly, the shoes’ uppers utilize the same cotton fabric that makes up their iconic Polo shirts. The model comes in several solid-colored and printed colorways, and their outsoles carry a nautical rope tread pattern. The slip-on Polo Ralph Lauren sneakers have elasticized side gores to keep the foot snug on the feet even without laces, padded leather collars for enhanced comfort, and reinforced leather heels. How to Style:Slip-ons, besides being comfy, are terribly convenient when one is running late for work. No laces to worry about and so easy to pull on. Pair your Polo Ralph Lauren sneakers with a stylish casual Friday work-ready outfit such as dark pants, a navy cardigan, and oxford shirt. Make sure to choose only dark footwear colorways for your office attire. But for weekends or off-hours, a crew neck tee under a white long-sleeved shirt paired with ripped jeans would look fantastic. Polo Ralph Lauren Thompson Print Twill- People who want a little twist to their usual footwear would fall in love with the Janis. These Polo Ralph Lauren sneakers have uppers made of a cotton twill fabric with a Polo print inspired by Southwestern blankets. Each shoe has twin gore styling for convenient on and off and enhanced comfort. Subtly embroidered Polo Ralph Lauren logos on the top part of the shoes are the only hint of the prestigious brand behind these beautiful kicks. How to Style: Getting chic for the summer should be pretty easy with these slip-on Polo Ralph Lauren sneakers. Dress up denim shorts by matching them with the slip-ons, a white chambray polo shirt, and a cardigan. You can also wear slip-ons throughout the fall and winter seasons by matching them with khaki chinos and a v-neck sweater. Check for quality. Polo Ralph Lauren sneakers are of excellent quality and contain details such as neat stitching, durable materials, and so on. There should also be a clear space between the words of the brand. Counterfeit products generally lack these and are badly made with uneven logos or use poor quality materials. Misspellings and illegible fonts are also signs of a fake item. Look at the logo. 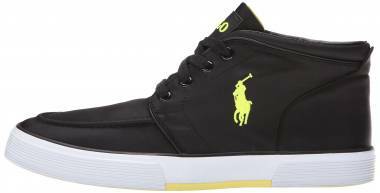 Depending on the shoe model, some genuine Polo Ralph Lauren sneakers feature an embroidered graphic of a polo player on a horse and holding a mallet. All four of the horse’s legs should be clearly defined, unlike in fakes where two of the legs seem to be merged together. You should be able to see a clear outline of the rider’s leg in the genuine article. If the logo is crooked or deviates from the authentic logo, then you know it is not genuine. Look at the price. Compare pricing with official stores and approved retail outlets. Polo Ralph Lauren sneakers sometimes go on sale, but if the price is too low, it generally is fake. We’ve compiled a list of questions most often asked by consumers about Polo Ralph Lauren sneakers and our answers to them. Q: How is the Polo Ralph Lauren label different from the other Ralph Lauren ones? A: The labels differ from one another in price point and theme. For example, the Polo Ralph Lauren brand was launched in the year 1967 and initially offered only tailored clothing and sportswear for men until the year 2014 when the label added women’s and kids’ products too. It’s a more expensive label when compared with the affordable Lauren brand which, in turn, initially offered only womenswear but now has men’s suits and shirts as well as beddings and bath products. The RRL label has clothing and accessories with roots in military gear and workwear, and the Ralph brand is slightly higher-priced than the Polo. Their highest end line, shown on runways, is the Ralph Lauren which has the Purple Label for men and Collection for women. Q: Can women wear silhouettes specifically designed for men, and vice versa? A: Yes. But men’s measurements are generally wider and bigger than women’s, and there can be a difference of one and a half to two full sizes between the two. The sizes also vary depending on the model. The general rule to follow is men must size up to enjoy women’s silhouettes while women should size down. Q: How can I make my Polo Ralph Lauren sneakers last longer? I only use them casually and never for any fitness or sport activity. A: The fabric that covers your Polo Ralph Lauren sneakers will be a major factor in determining how long your shoes will last. As mentioned before, leather ones usually last longer than other fabrics but how you take care of them are also equally important. If you get your Polo Ralph Lauren sneakers wet, make sure to dry them thoroughly first before storing away. Rot can set in if you put them away while still wet. Keeping your sneakers clean is important. After a full day of being outside, your Polo Ralph Lauren sneakers might be caked in mud or covered in dirt. Clean them according to the type of fabric they are made of. Leave out to dry. Make sure to give your shoes a rest to let them breathe. Don’t use the same sneakers day in and day out. Baking soda is a cheap way to remove any odor from footwear. Sprinkle some on the inside of the box where you keep your Polo Ralph Lauren sneakers to keep them fresh as well as draw out any remaining moisture from the shoes. Q: How do I clean my Polo Ralph Lauren shoes? A: You should take into account the type of fabric that makes up your shoes. Real Leather - Leather shoes should be wiped off with a damp cloth. Synthetic or Handmade Leather- This type of material can be cleaned with a soft cloth or soft bristle brush. You can use water and mild soap for this. Suede and Nubuck - There are brushes and cleaning solutions available that are made specifically to clean suede since this can be a hard material to take care of and keep stain free. Nylon and Canvas - Nylon and canvas materials are the easiest to keep clean. Scrub the uppers of your Polo Ralph Lauren sneakers with a soft brush or a cloth soaked in a mixture of water and soap. Rinse off. Don’t forget to clean your shoelaces too. Most can be machine-washed (place in a small bag first) except suede and leather laces. If your insoles are removable, take them out, and air dry separately. Remember never to use harsh cleaning solutions or bleach on your footwear. Your Polo Ralph Lauren sneakers should also never be thrown into a washing machine to be cleaned, even if they are made of canvas. Q: Do surfaces have any effect on how fast my Polo Ralph Lauren sneakers wear out? A: Hard surfaces like pavements and asphalt are harder wearing on soles than soft ground. But this shouldn’t affect your soles too much unless you are walking and on your feet all day. Gait is the bigger factor. How you walk and which areas of the shoe you place your weight on will determine how fast your kicks wear out and which spots on your footwear deteriorate faster. Q: I’m concerned about traction. How can I tell which Polo Ralph Lauren casual shoes have good grip? A: You need to take a look at the outsoles. Soles made with soft rubber have a better grip than those made of hard rubber or other materials like leather. Tread patterns also make a difference. Open treads will push the liquid out, in case you step on wet surfaces, and allow your shoe to get in contact with the ground more. Enclosed treads tend to trap the liquid inside, creating a barrier between the floor and your shoes which could cause you to slip. Q: Can I use my Polo Ralph Lauren sneakers for physical activities like tennis or other sports? A: Polo Ralph Lauren sneakers are designed primarily for lifestyle use and not for sports. There are other sports-specific shoes available that may function better for the sport of your choice. Physical activities such as these may also cause your shoes to wear out faster than they should. However, this does not mean that these sneakers won’t do well when utilized for fitness or athletic activities. Q: Are there Polo Ralph Lauren shoes that can comfortably accommodate people who suffer from knee pain? I want to go out and look stylish but do so comfortably. A: With Polo Ralph Lauren sneakers, you shouldn’t have any trouble looking stylish. But to answer your question, yes there are. Just look for shoes with flat and flexible soles as these reduce the load on knee joints more than stability shoes. Choose one that is lightweight and with good heel and ankle cushioning. Q: Where is the headquarters of the Ralph Lauren Corporation located? A: The Ralph Lauren Corporation is an American company and their main office is located in Madison Avenue in the Upper East Side of New York. The Ralph Lauren brand is synonymous with luxury and menswear. Though the internet is full of news about his success and products, not much is known about the man behind the brand. Here are some trivia about Ralph Lauren. Ralph Lauren was not the designer’s real name. He was born as Ralph RuebenLifschitzto Ashkenazi Jew immigrants, Frank Lifschitz and Fraydl Kotlar, who hailed from Belarus. The family’s surname was changed by one of Ralph’s brothers, Jerry. Ralph Lauren started off as a Brooks Brothers salesman. The designer first became known for his unusual tie designs, which were wide and quite different from what was available at the time. What is less known is that he made them from old rags and he would go from store to store just to sellthem. Ivy League clothing brand founder Norman Hilton was the one who got Ralph Lauren his first significant start in the business by loaning him $50,000. The iconic polo shirt was not invented by Ralph Lauren but by a tennis player named Rene Lacoste although it was Lauren who made the casual top a wardrobe staple. The shirts debuted in 1972 in 24 colors in a single fit. The 1974 ‘The Great Gatsby’ movie helped the Ralph Lauren brand become even more famous. Leading man Robert Redford’s dapper outfits were all designed by Ralph Lauren. Ralph Lauren has a massive car collection which contains over 70 models. One of them is a Bugatti worth more than $40 million, only one of four such models to be produced, and built by hand by Jean Bugatti himself. 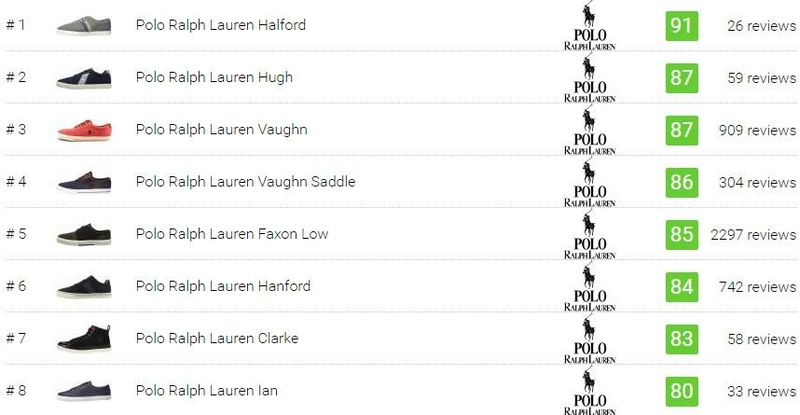 The Ralph Lauren brand has around 30 sub-labels under it. Ralph Lauren is the only designer ever to win all four top awards from the Council of Fashion Designers of America. The Ralph Lauren brand name is pronounced like in the girl’s name with the emphasis on the first syllable (Lau) instead of on the end of the word.